Many Chicagoans have become used to the sight of cars propped up on cinderblocks, stripped of wheels on North Side streets. Hardly a week goes by that we don’t hear from a victim of wheel thieves, the phantom operators who steal during the dark of night and rarely face arrest. But today, there is good news. Chicago cops have now arrested two men for stealing wheels in the Avondale neighborhood after getting a tip and staking out one of the suspects' cars. 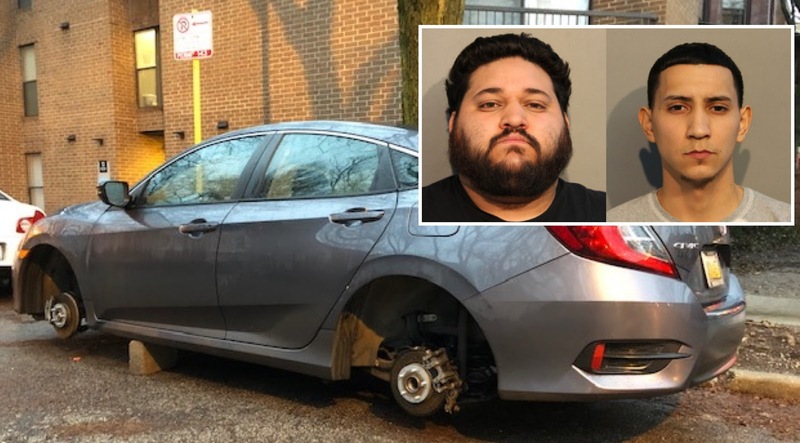 Albany Park residents Daniel Vidaurreta Alvarez, 29, and 25-year-old Brandon Huizar were arrested at 4 a.m. on Jan. 25th after cops in a covert vehicle allegedly watched their entire wheel theft process. Undercover officers were watching as Alvarez double-parked his Volkswagen Passat and turned off his lights next to a parked Honda Accord in the 2900 block of North Washtenaw around 3:30 a.m. Alvarez and Huizar got out and began loosening the Honda’s lug nuts with hand tools, according to police. The two men returned to Alvarez’s car, drove around the block, parked next to the Honda again, and loaded its four tires into Alvarez’s back seat, police said. The Honda was left teetering on landscaping blocks. Cops then tailed Alvarez’s car and watched as he and Huizar unloaded the tires into a garage in the 4400 block of North Keokuk, according to court records. Marked patrol cars were called in to arrest Alvarez and Huizar minutes later. Police said they found a tire iron in Alvarez’s driver’s seat. On the passenger’s side was a four-way lug nut wrench with a bag containing 13 wheel lock keys. The trunk, police said, contained a floor jack and two snow-covered landscaping blocks. A search warrant was obtained for the garage. Prosecutors charged Alvarez and Huizar with one count of felony theft each. Judge Sophia Atcherson released the men on recognizance bonds. Cops in other parts of the country have said that Honda wheels are popular with thieves because they have a common bolt pattern. That makes them easy to resell and their small, 19-inch size are “stylish” when bolted to a souped-up car.